This teeth whitening kit includes about 10 applications. 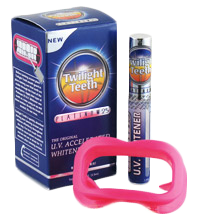 Twilight Teeth is quickly absorbed during your tanning session and whitens effortlessly throughout the day. For best results teeth should be clean before treatment and do not eat or drink for 15 minutes after tanning session. Twilight Teeth starts working in as little as 6 minutes.